Kaeng Nor Mai (Lao Bamboo Shoot Soup) made by my Aunt for dinner in Vientiane, Laos. 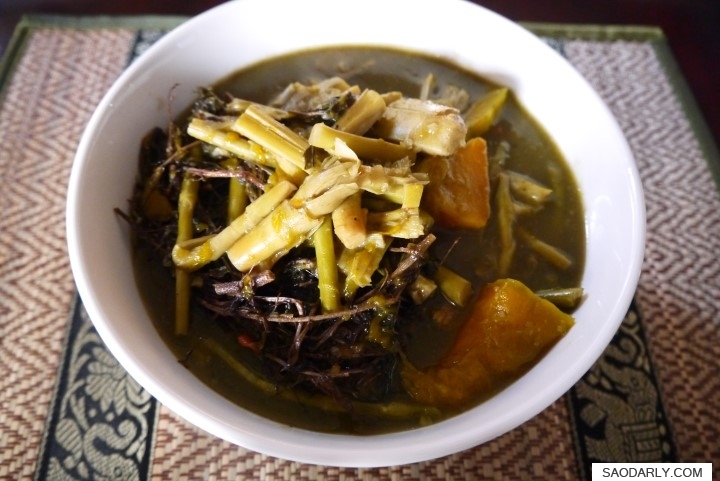 This version has sweet pumpkin and phak kayang (Rice Paddy Herb) for the extra aroma and taste. I like Kaeng Nor Mai plain, which means no meat like pork or fish like Mekong Catfish added to the soup stock. Bamboo Shoot Soup is good with steamed sticky rice or steamed Jasmine Rice, and with spicy dipping sauce for a full meal.